Welcome to the website of the Liberty Seated Collectors Club. 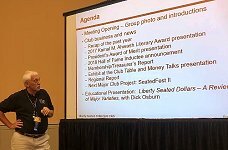 The Liberty Seated Collectors Club is a not-for-profit group of over six hundred collectors and dealers dedicated to the study and attribution of the American silver Liberty Seated coinage of the 19th century. Social interactions at a host of regional meeting venues throughout the United States are a key element of the "LSCC Experience." Please browse our website for news, upcoming events, educational programs, resources for collectors, and membership information. 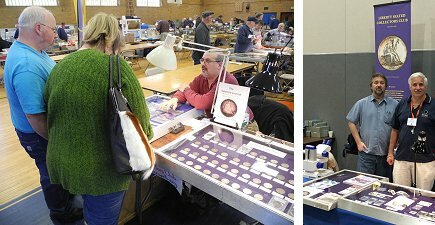 See for yourself why the LSCC is the best investment in numismatics. The following are regional coin shows or events at which the LSCC has a presence. → Click for the event website. Club table. Meeting and educational program: Friday 2:00 p.m.
LSCC meeting and educational program: Friday April 26, 9:00 a.m.
Norwich CT, at the Holiday Inn. Club table. No club table - meeting only. Friday May 24 at 9:00 a.m.
Club table, BCCS-LSCC Social, Thursday 6:30 p.m. Rock Bottom Brewery. Recordings of SeatedFest education programs available There were numerous educational programs presented at SeatedFest II in Baltimore during the 3-day LSCC convention. These programs were videotaped by David Lisot of CoinTelevision and are made available here, courtesy of David Lisot and also the Newman Numismatic Portal. To watch one or more of the programs, click left or go to the Recordings page. Photo of William Barber discovered! Unveiled in Baltimore at the SeatedFest II convention and announced in the March E-Gobrecht, we are pleased to present the first known photo of William Barber (1807-1879), 5th Chief Engraver of the U.S. Mint and designer of the Trade Dollar and Double Dime. The photo is made available for download and use in publications. To see and download the photo (in multiple formats and sizes), click left or go to the photo page. Respond to LSCC Members Survey on Challenging Dates The Spring 2019 issue of the Gobrecht Journal contains a survey for LSCC members on the most challenging dates/years in the Liberty Seated series to collect. Members may respond online. All of the information related to the survey is found in the Gobrecht Journal and is not available to non-members who do not receive that publication. To respond to the survey click left or go to the Survey page. The current issue of the E-Gobrecht can be found here by clicking the image to the left (5.1 mb). Remembering John McCloskey John McCloskey, Past Predident of the LSCC passed away on December 15, 2018. John was a giant in numismatics, and served as President of the Liberty Seated Collectors Club and Editor of Gobrecht Journal Editor for 40 years. To see a few photos and read remembrances from club members, click the smiling image of John at left. Images of many of the remarkable documents and ephemera will be available for download soon.